A sustainable urban theme is expressed throughout The Brewery, a LEED Platinum Neighborhood Development that renovates the prominent and historic Pabst Brewery manufacturing campus in downtown Milwaukee. Many concepts within this urban oasis are unique to the project, using materials that connect Zilber Park to its historic industrial past. Selected site elements include rusting wire mesh screens and bollards within the parking lot, a steel and granite gabion wall, formed concrete benches, urban tolerant trees, vines, and perennials to bring color and nature into the area, as well as an urban nursery to hold trees before transplanting into other areas of the development. An overall conceptual design for the block was completed to display potential development. Continuing the urban theme of The Brewery, the main parking structure incorporates numerous sustainable and urban landscape and storm water solutions. Located on a reclaimed brownfield, the structure is found in the former footprint of the Pabst Brewery fermentation building. Creative engineering solutions provide amenities for the project site and adjacent properties. 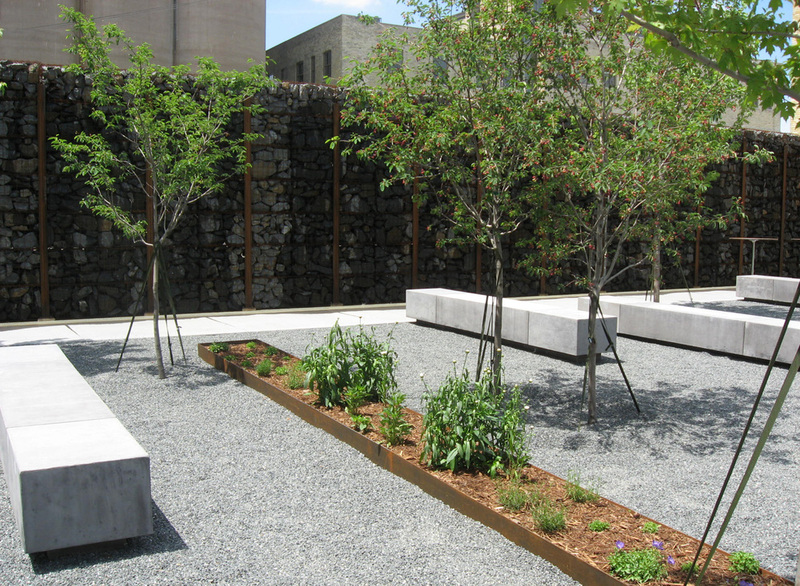 Recycled concrete slabs provide permeable pavement around portions of the building while vegetated bioswales filter and control storm water from the upper deck and adjacent pavement. The project included collaborating with other professional firms to establish building and sidewalk elevations as the adjacent roadways were being designed consecutively. Extensive coordination and cooperation with the city was also required to fast-track permitting and clarify details for this new development as private and public utilities were installed simultaneously.